Would an April income tax bonanza tempt lawmakers to abandon fiscal reform? After nearly a decade marked by frequent state budget deficits, Connecticut soon may have enough money to erase shortfalls this fiscal year and next — and even restore a few items desired by legislators from both parties. Even if a positive income tax trend continues, legislators can’t spend the money — unless they abandon a budgetary mechanism enacted just six months ago to force better savings habits. At issue is one highly volatile portion of Connecticut’s income tax system — the quarterly filings that reflect capital gains and other investment earnings — and a new capping system designed to stop legislators from spending too much of those proceeds. On paper, the budget’s General Fund for the current fiscal year, which ends June 30, is slightly less than $200 million in deficit. But that doesn’t take into account $665 million in quarterly income tax payments received in December and January. In other words, in past years state officials would be projecting a $465 million surplus, rather than a nearly $200 million shortfall. As part of the new state budget last October, legislators adopted a “volatility cap” that prohibits the state from spending any quarterly income tax receipts in excess of $3.15 billion per year. And Wednesday, when legislators got their first update on income tax receipts since the April 17 filing deadline, they learned quarterly filings now are expected to exceed the volatility cap limit by $813 million — an increase of $148 million since December and January. That $813 million estimate still could change significantly. Legislators receive daily updates on income tax receipts during the second half of April, and projections sometimes change by more than $100 million in one day alone. Regardless of whether that potential bonanza holds up, some legislative leaders said that really doesn’t matter. The volatility cap system calls for any extra dollars from quarterly filings to remain in fiscal limbo until September — when the comptroller officially closes the books on the previous fiscal year — at which point they are deposited into the emergency budget reserve, also known as the rainy day fund. 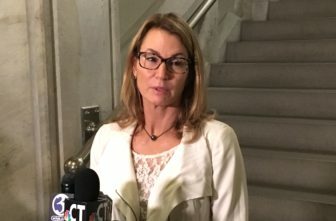 House Minority Leader Themis Klarides, R-Derby, said her caucus would oppose any effort to suspend the volatility cap system and tap those dollars now. Besides the nearly $200 million deficit projected for the current fiscal year, nonpartisan analysts say the preliminary budget for 2018-19 would run — unless adjusted — $265 million in the red. Lawmakers from both parties also want to make other changes to reverse cuts to a Medicaid program and aid for towns — potentially costing an extra $150 million or more. Would legislators be tempted — if final revenue projections due April 30 show a big bonanza of income tax receipts from quarterly filings — to spend some rather than save all of it? 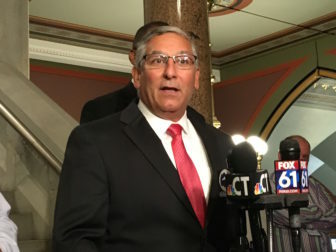 Senate Republican leader Len Fasano of North Haven said it’s important not only that legislators resist tampering with the volatility cap, but also that they eliminate the nearly $200 million deficit this fiscal year before the regular 2018 session closes on May 9. “If you don’t do a deficit-mitigation plan, you have determined that you want to spend that money” earmarked for the rainy day fund, Fasano said. That’s because Comptroller Kevin P. Lembo would be required by law — if he certifies a deficit when he officially closes the books on the 2017-18 fiscal year in September — to draw down the emergency budget reserve to cover that gap. 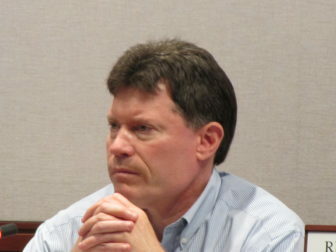 Sen. John Fonfara, D-Hartford, who spearheaded the push last fall to establish the volatility cap, said he would oppose carving out any exceptions to the new system, and predicted many lawmakers from both parties also would be unwilling to do so. But, Fonfara added, if Connecticut spends — rather than saves — any 2018 income tax bonanza on recurring programs, those same programs might need to be cut a few years down the road if unstable income tax receipts shrink once again. “We could be right back in this difficult place again very soon,” he said. 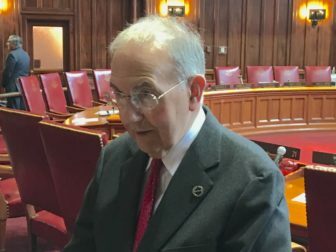 Senate President Pro Tem Martin M. Looney, D-New Haven, called the volatility cap “extraordinarily good public policy” that recognizes the unstable nature of one key component of the state tax system. Quarterly filings, which are expected to provide about $3.8 billion or 40 percent of the full $9.8 billion expected from the income tax this fiscal year, are one of the most volatile revenue streams in the state budget. Since the income tax was enacted in 1991, this component frequently varies from year to year by double-digit percentages. By comparison, the paycheck withholding portion of the income tax, which provides the other two-thirds of receipts, or $6 billion, routinely grows or shrinks by a few percentage points year to year.